These are some of my favorite quick little styles out there. 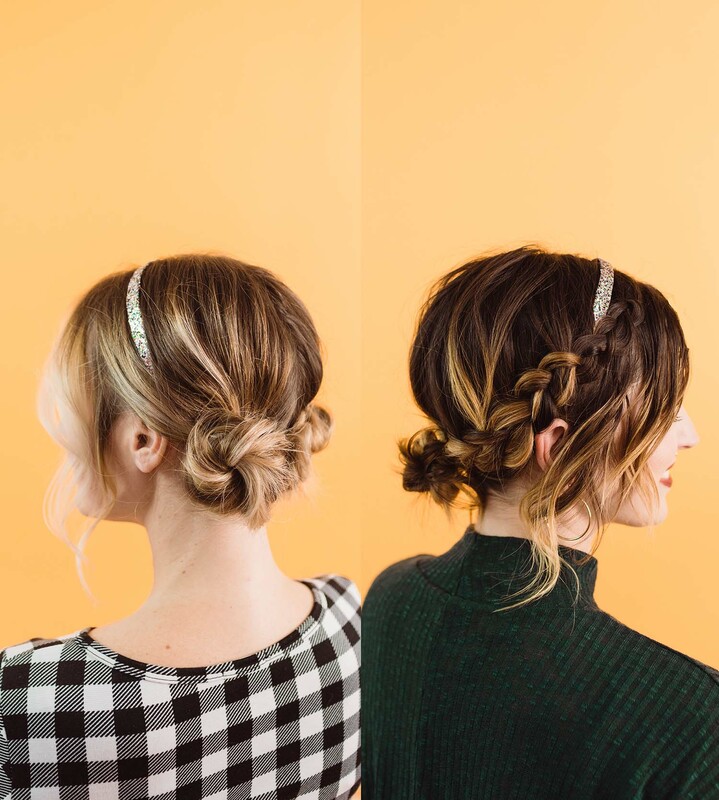 Both are super easy updos that anyone could style, plus I’m gonna show you a couple options depending if you have medium length hair or longer hair to style. 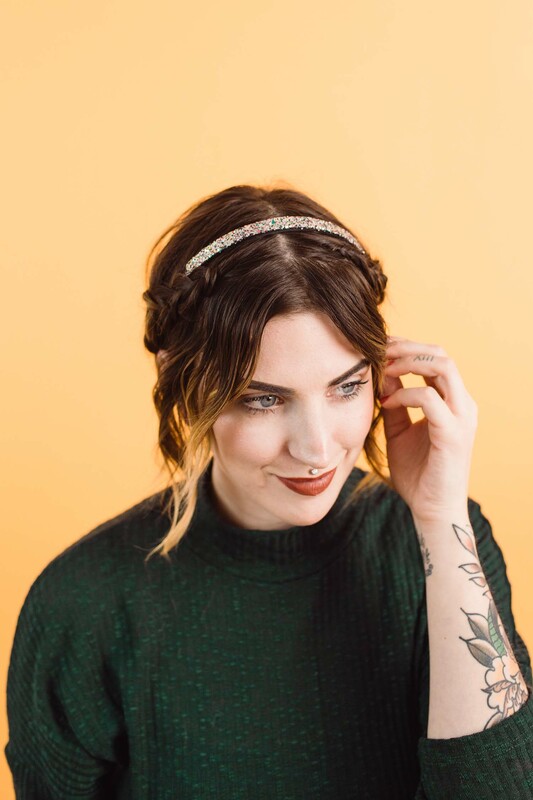 Plus adding a cute accessory like this sparkly headband makes it even better (I mean, glitter, am I right?). 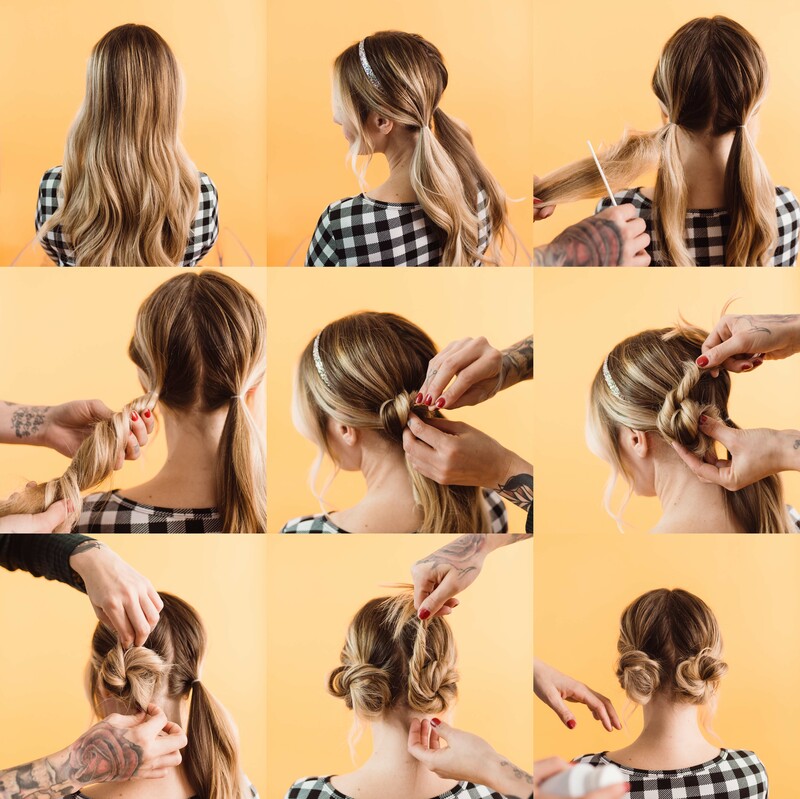 These are quick and easy hairstyle options for any day, but especially if you need something simple for an upcoming holiday party look. For me, it’s easy to forget that with a shorter length I still have options with how I style my hair. 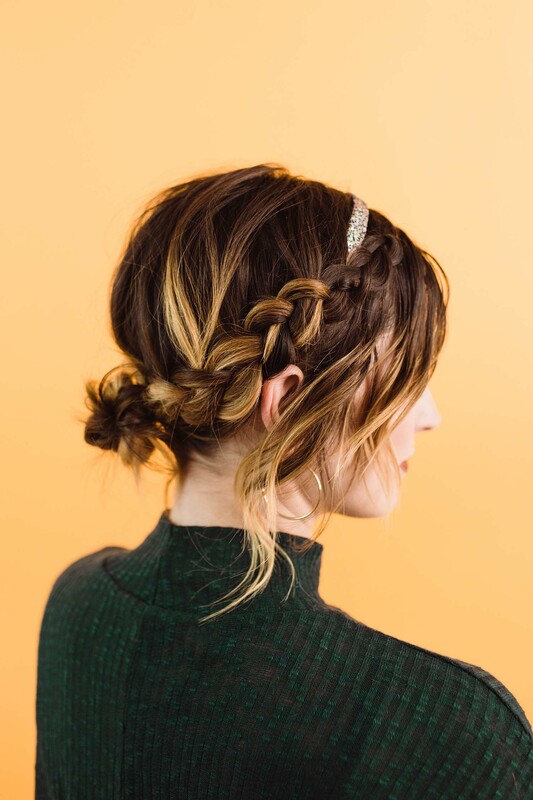 For this one, I incorporated a cute headband and some simple braids into my go-to low bun style that I do a lot (like a lot!). Which is great for cute, yet casual, when you’re wanting to spruce up a simple style. I started out adding some texture and wave to my hair, then placing my headband on so we don’t have to maneuver it over the braids later on. Then I took a small triangle section on one side of my part, right in front of the headband to start creating a dutch braid. I was sure to leave out some hair by my face because I like some to frame my face once it’s all done! 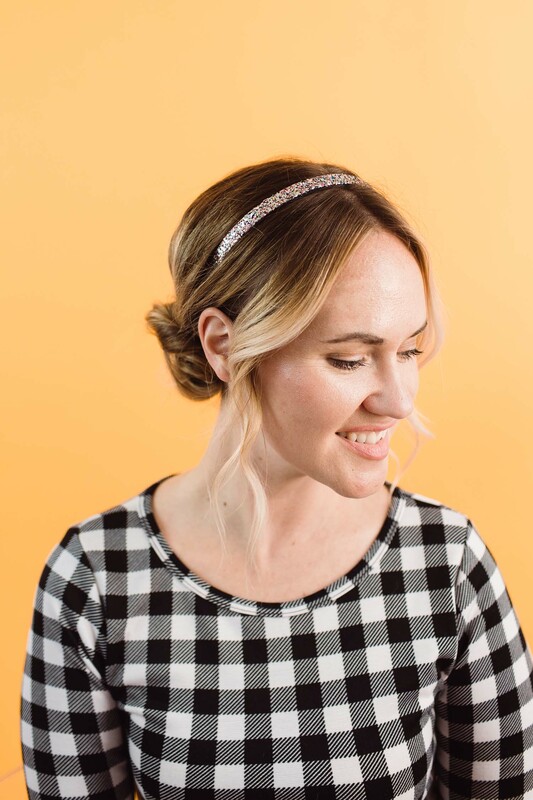 Work the dutch braid until you pass over the top of the headband, then continue by adding hair from the other side of the headband. 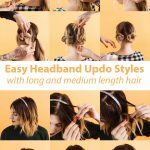 This will conceal and secure the headband in place under your style. 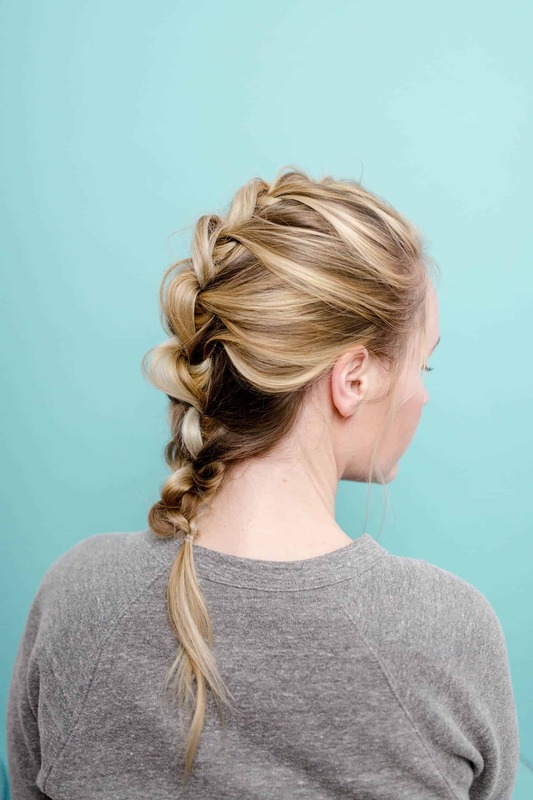 Once the braid reaches to the back of the head, you can secure with an elastic. 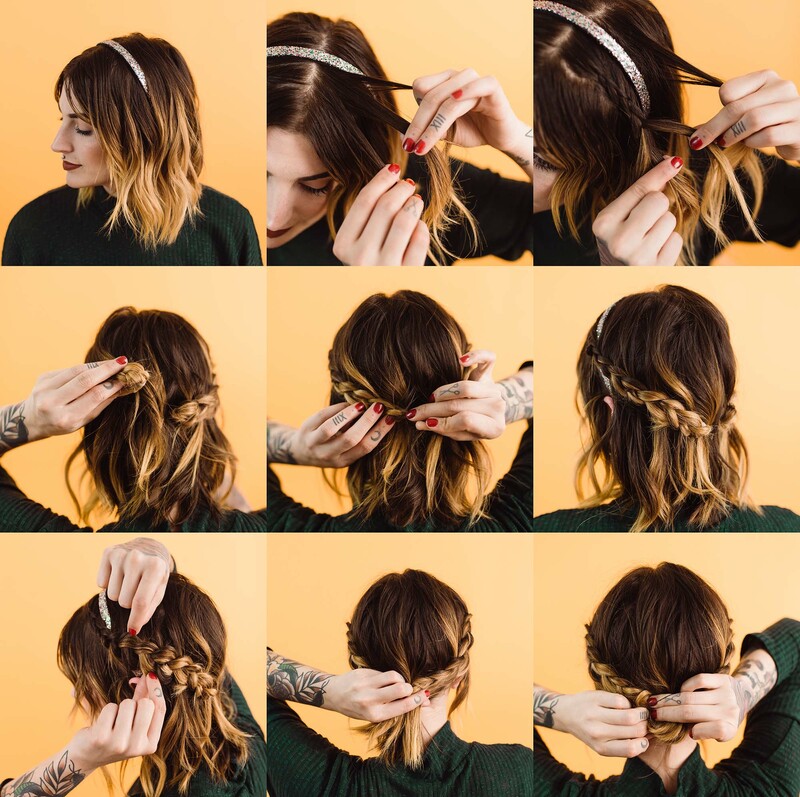 Repeat steps 1-4 on the other side of the part, until you reach the back of the head, then combine the ends of each braid with an elastic. Then I went back through and pancaked the loops of the braid to expand the shape of it and make it look fuller. Lastly, I combined all the hair left out with the ends of the braids into a low bun using a ponytail holder, and then you’re set! 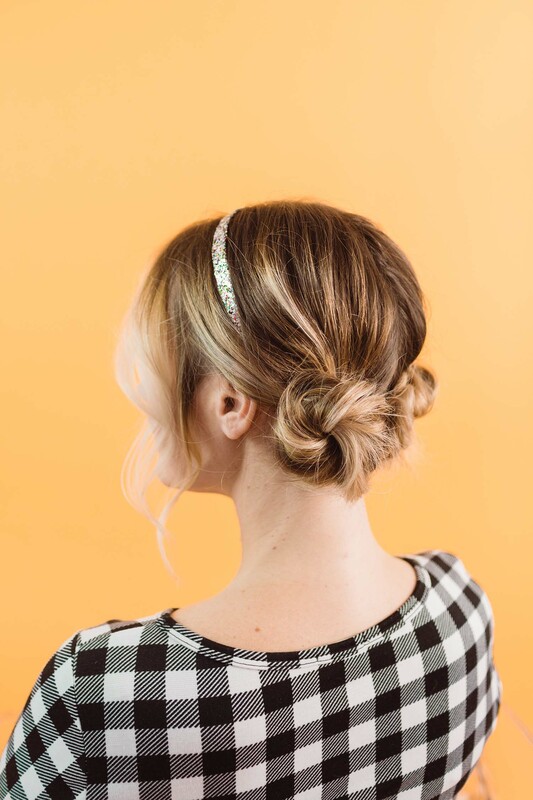 For this super easy updo, even if you have longer hair to work with, it won’t take you much time at all. I love this for a party style or something that’s dressed up, but still sort of casual. The perfect middle ground! We started out with some loose waves throughout. I did these waves with a flat iron then lightly brushed through them. Then, I lightly back-combed each ponytail. Nothing too extreme, just to add some loose texture and grip to the pony. Once you’ve done that with both sides, lightly twist one at a time, pinning into place as you go, loosely pulling it around the elastic. 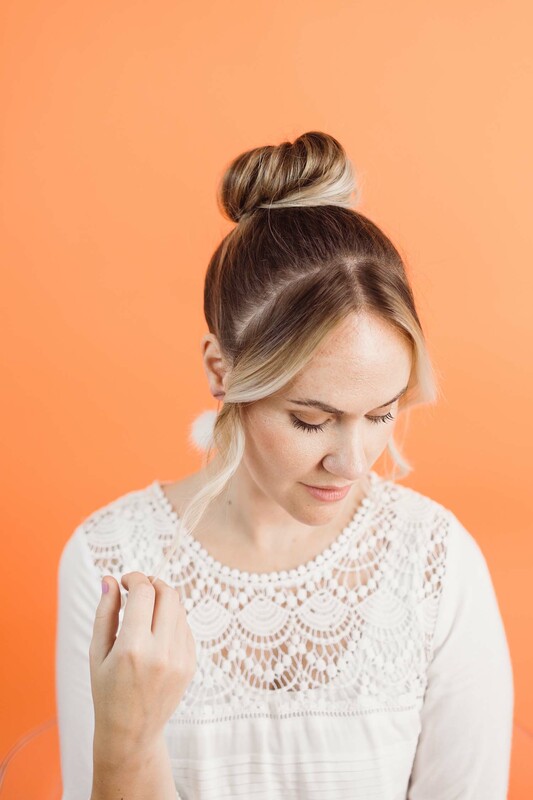 Once you run out of length and have securely pinned the twist into place, I went back in and lightly pulled at the bun to give it a “perfectly-imperfect” feel, without being so tight. I repeated those steps on the other ponytail, making sure they are balanced, but they don’t have to be exact. Sisters, not twins! Awe, this is cute! My mom does styles like this for me sometimes. I don’t know why, but I always have trouble doing them myself. Does anyone else have this problem? I might have to show her this in hopes she’ll give it a try! These look great for super long hair too. Pony tails and loose buns get SO painful! At least the hair weight would be distributed evenly on your head. It’s like the longer my hair gets the lazier I am ha. I have that really annoying “not sure whether to grow it out or cut it” style. But these ideas are great for my length. Maybe I’ll change up my routine. Cheers, guys! Oh I love these! They’re so cute! I keep umming and arring about getting it cut. Eeek! The short hair braid is S U P E R cuuuute. have you guys thought about maybe including quick videos? because i can see what she did but from step 2-3 i mess everything up and then give up and never try it. im more of a visual learner. These are so cute and easy! I’m going to try one for date night this weekend. 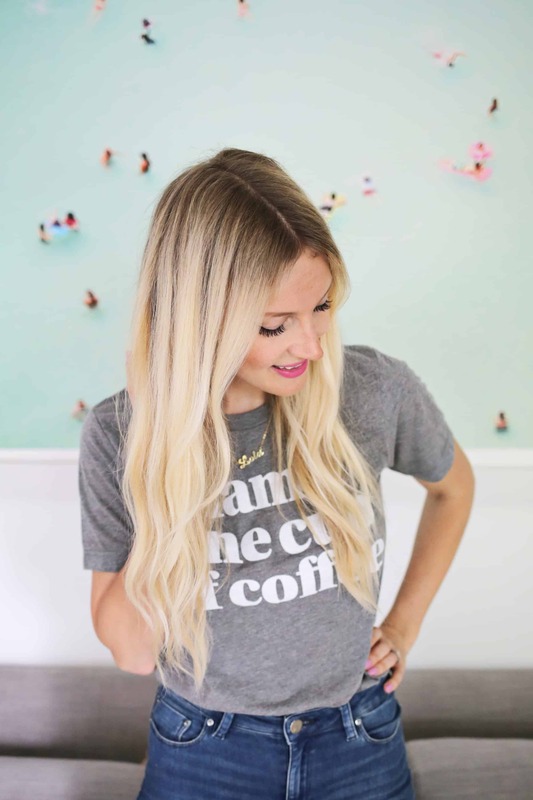 Really great hairstyle for my long hair.Thanks for sharing this! !